Congress has made sure you don't have to wait too long at the airport because of the sequester—but if you’re unemployed, you’;e out of luck. The sequester isn’t so scary—that’s what The Washington Post proclaimed this week. It’s an attitude many people in Washington seem to have adopted, as momentum to solve the slashing automatic cuts has almost entirely vanished. But for Sharon MacGregor, a graphic designer and medical education worker in Paterson, New Jersey, the sequester is terrifying indeed. MacGregor was laid off last July when her company went belly-up, and she is still looking for work. She is one of the 4.3 million* Americans who are “long-term unemployed,” which is defined by the Bureau of Labor Statistics as being unable to find work for more than twenty-seven weeks. Once you become long-term unemployed, you start drawing from the federal Emergency Unemployment Compensation fund, which was signed into law by George W. Bush in 2008 as the economy cratered. 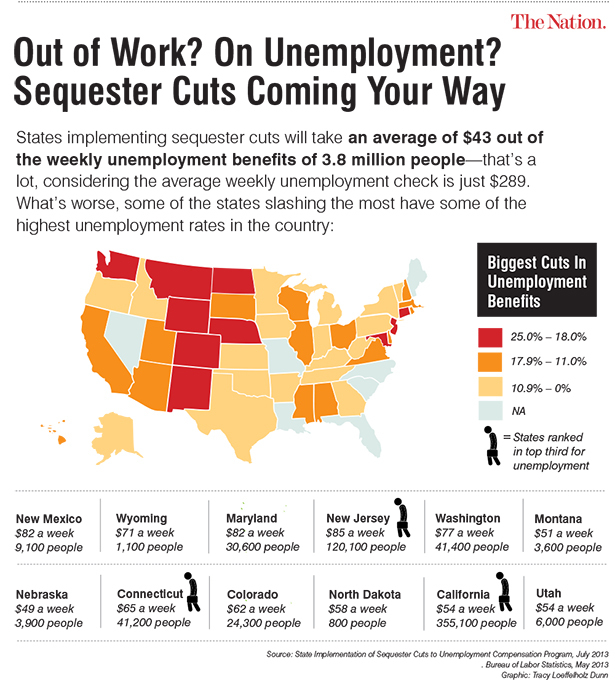 The idea was to throw a lifeline to people who exhausted the standard twenty-six weeks of state unemployment benefits, in a recession that, even today amidst a so-called recovery, has an average unemployment length of almost thirty-seven weeks. But the EUC, like most federal programs, is subject to the automatic sequester cuts, and will lose $2.4 billion this fiscal year. (That represents 8 percent of the $30 billion in domestic non-Medicare budget sequester cuts.) It’s a big chunk of money—and it’s being taken away from the people who have already suffered the most during the downturn. The average resulting benefit reduction is $43 per week, out of an average EUC benefit of $289. States have some flexibility about when to implement the cuts, and New Jersey chose June 30—meaning that very soon, MacGregor will get her first check where her benefits have been sequestered by the US Treasury. Because she collects close to the maximum EUC benefit, MacGregor expects to lose $225 every two weeks. She added that she is allowed to work part-time in addition to her unemployment benefits, but can’t earn more than 20 percent of her unemployment check, or else she’ll lose the benefits. But since the check is smaller, so too is the 20 percent threshold. “So it’s not like I can even make up the income anywhere else—I can’t,” she said. MacGregor’s story is unfortunately typical for the millions of Americans who will see their long-term unemployment benefits cut, or already have. NELP released a study this week showing how the EUC cuts would be felt in all fifty states, which faced difficult choices about how to implement the benefit cuts. Some initiated the cuts quickly, which meant the benefit reductions were spread out over more time and thus smaller—about half of the states initiated the cuts in May and June. The states with the highest percentage reductions for all weekly EUC benefits are Maryland (22.2 percent), New Jersey (22.2 percent), Montana (19.6 percent), Connecticut (19.2 percent), Arizona (16.8 percent) and Illinois (16.8 percent). New Jersey, like several of those states, has among the highest unemployment rates in the nation. The delay in implementation meant an average cut of $85 per week in the state, or a 22 percent reduction. MacGregor said she’s reached out to all of her Congressional representatives, pleading for a fix—but hasn’t gotten anywhere. “You get the standard BS back. The BS form letters you get back. You never get anybody to call you, or get back to you personally,” she said. *This number has been updated.